We are in the process of creating the SkillSelect section of our website. It should be available by the end of the year. 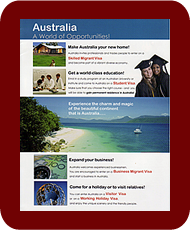 In the meantime, please "view our Welcome" page for basic information about SkillSelect, the new visa issuing system, which has fundamentally changed Australia's skilled visa application process.